DES MOINES – The Iowa Barnstormers of the Arena Football League are pleased to announce their 2011 regular season schedule. The Barnstormers will open the 2011 season on Saturday, March 19th when they travel to Pennsylvania to take on the expansion Pittsburgh Power. Six days later, Iowa returns to Des Moines for their home opener on Friday March 25, when they host the defending Arena Bowl Champion Spokane Shock at 7:05pm. For the 2011 season, the Barnstormers will compete in the AFL’s Central Division. Iowa will play 8 division games comprised of home and home sets versus Chicago, Dallas, Kansas City and Tulsa. The Kansas City Command has become the Barnstormers newest rival, with Iowa making their inaugural trip down I-35 on April 9 for a battle at the Sprint Center. Kansas City returns the favor on Saturday, July 9 when they come to town to Battle the Barnstormers at Wellmark Field in Des Moines. Other highlights of the 2011 schedule include home games against former AFL Champions, the Chicago Rush (April 16), Philadelphia Soul (April 30) and Orlando Predators (June 4). Iowa kicks off the July 4th weekend with a home game against the Tulsa Talons on Friday, July 1. The Barnstormers wrap up their regular season home schedule on July 23, when the Georgia Force comes to town. Once again this season, all Iowa Barnstormers home games will be played on Wellmark Blue Cross Blue Shield Field at Wells Fargo Arena. This season, all 9 home games will be played on Friday and Saturday evenings with a kickoff time of 7:05pm. 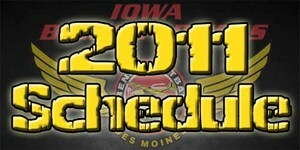 The complete 2011 Iowa Barnstormers regular season schedule is attached. Season tickets for the 2011 season remain on sale now for as little as $117.00 per seat. Don’t miss a minute of the action this season! To order your seats or for more information call the Barnstormers at (515) 633-2255 or log onto www.theiowabarnstormers.com. **All Game Times CST and subject to change.